The U.S. ambassador to Libya, Christopher Stevens, is dead today, along with three other Americans who worked at the embassy, following an attack on the consulate in Benghazi by a group calling themselves the Supporters of Sharia, who were angered by a film circulated on YouTube which portrays the Prophet Mohammed as a sexually depraved lunatic. Earlier in the night, angered by the same film, members of a crowd outside the U.S. Embassy in Cairo scaled the outer wall to pull down the American flag, and replace it briefly with a black flag with an Islamic slogan. Fortunately, Egyptian security forces got control of the situation, and no one was hurt. The events in Libya took a more serious turn. Apparently, an armed group of Islamists “came out of their military garrison” to attack the consulate, firing rockets into the building and setting it on fire. Ambassador Stevens died from smoke inhalation. A career diplomat, he had been ambassador for only four months, though he was in Libya last year to work with anti-Qaddafi rebels. 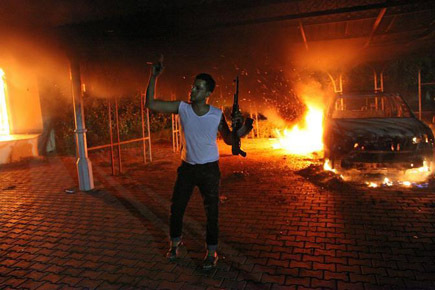 Tragicallly, he was on a brief visit to Benghazi when he was caught up in the incident. Photos on the website of the Italian newspaper Corriere della Sera, apparently taken by the attackers themselves, show not an image of hardened fighters but a group of youths, arms raised in triumph and exulting at what they had done. This only adds to the tragedy in my mind. Did they know they were responsible for the death of a man who had been working for their own freedom just a year before? I’ve watched the film, or more precisely its trailer, and I can say that it is a warped, degrading portrayal of the Prophet Mohammed. The attackers may have been extremists, but the film is extremist in its own way. If there was ever a film designed to insult Islam, this is it. As the New York Times puts it, Mohammed is shown as “a child of uncertain parentage, a buffoon, a womanizer, a homosexual, a child molester and a greedy, bloodthirsty thug.” Besides that, the acting is terrible—”an amateur cast performing a wooden dialogue,” as the Huffington Post says. The filmmaker, Sam Bacile, who is now in hiding, says he raised $5 million to make this travesty. It has been shown only once in its entirety, in a near-empty theatre. So why did four people have to die for this project, who very likely knew nothing about it? What were the attackers thinking, when they imagined that the Benghazi consulate, or the Cairo embassy, was a fitting target for their rage? Did they believe it was an official project of Washington or Hollywood, when it was neither? Perhaps they think that our government has the power to ban expression it doesn’t approve of, when it does not. More to the point, who cares what this jerk thinks about your religion? He’s an insignificant nobody who you’ve just given a huge boost of publicity—like Terry Jones, the pastor who burned a Qur’an, and who helped to promote this film. I can understand that after being driven to extremes by a murderous dictator, your dignity is all you have left. That’s what you fought for. But in the big world out there, somebody, somewhere will hold your values in contempt. They want to prove you’re savages, and you’ve given them just what they wanted. Now the aftermath will be politicized, and we’ll hear the usual refrain. Obama is weak on Islam. He thought he could deal with these people, and look what happened. He would rather apologize for America’s values than defend them. Already it’s begun. As Alan West, the right-wing congressman from Florida, said: “The Obama Administration touted the Arab Spring as an awakening of freedom, which we now see is a nightmare of Islamism.” We’ll be hearing more of that soon. For now, let’s mourn four people who did their best to help the cause of freedom, and got caught up in a tragic mistake. 1) U.S. officials suspect that the attack on the Benghazi consulate may have been planned in advance, using the Mohammed film only as a convenient excuse. One reason for this suspicion is that the Americans were attacked not once, but twice, the second time after retreating to a safe house in a different location. Details are here. All in all, a complex series of events, whose true significance is still evolving on many fronts. Posted by Marcel Côté on 12 Sep 2012 at 12:44 under Extremism, Libya, Politics, Religion.